Do architects have the answer for distressed public housing? 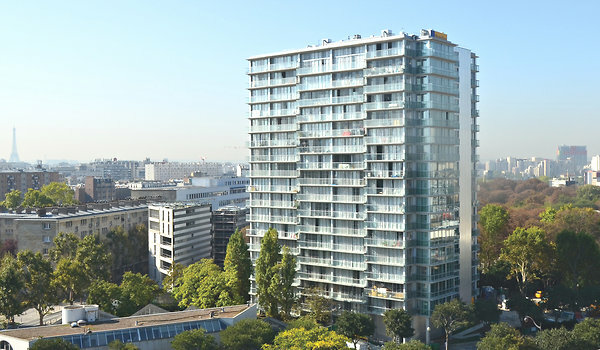 The New York Times recently touted the shiny retrofit of a Paris public housing tower. Hard by the noisy highway, overlooking a cemetery and a former garbage dump, La Tour Bois-le-Pretre glimmers on a spring morning. Sheathed in a fresh cloak of glass balconies and corrugated aluminum panels, it rises on the edge of this city amid a landscape of decaying cement-and-brick blocks. Is it really that easy? All it takes is an architectural makeover to transform a distressed and dangerous housing project into a dignified and livable home for poor people? No. In cities across the United States, we’ve learned from bitter experience that warehousing low-income families in huge apartment projects is a mistake, no matter how great the design might look at the ribbon-cutting. Too often, these projects are sited in poor neighborhoods that lack jobs, good schools, decent grocery stores, and safe places to play, isolating residents from economic opportunities. Over the years, unemployment, social alienation, crime, and violence exact huge costs—for management and maintenance, for the life-chances of children, and for the surrounding community. A better solution is to integrate affordable housing into thriving communities, where residents can buy healthy food, send their kids to good schools, and venture outside without fear. That means building smaller-scale apartment buildings, subsidizing some landlords to make units in their existing properties more affordable, and letting families use vouchers to cover the rent for regular homes and apartments. It also means replacing failed high-rise projects and improving the distressed neighborhoods around them, bringing services, amenities, and opportunities that attract and serve residents well. At first blush, a cosmetic retrofit may look like a bargain. But in fact, the long-term cost to taxpayers of leaving high-poverty housing projects in place exceeds the cost of an effective redevelopment effort. I’d far rather see decent, affordable housing in a thriving, opportunity-rich neighborhood than an architectural landmark in a still-blighted community. The title of this post makes a claim that neither the original NYT article nor the architects themselves make, and then refutes it. No, architects do not "have the answer" for distressed public housing any more than lawyers or politicians or social workers or even the residents themselves alone have the answer. It's a distressingly complex issue where the scale of the problems overwhelms any individual claim on a solution. Beyond the pretty picture here, what this project did do (according to the article) is to dramatically improve an existing building, at lower cost than demolishing it (approx half), with less displacement of the current residents (short stints rather than months/years), and producing significantly lower energy and operating costs going forward (60% more efficient). It would be nice if a portion of the $$ savings could be applied directly to support social services and other community benefits, but that's surely not a requirement the architects can make. Importantly, the article also notes plans to extend the Paris subway out to this and other isolated low-income communities--surely that will help the overall community. To quote the NYT piece: "Architecture has its natural and obvious limits, in other words. But it is powerful as well." We housers need all the power we can get behind an array of solutions for low income families and neighborhoods. Architects and architecture--even beauty--surely have much to contribute to those solutions.